Friday afternoon was upon us, and what better way to start the weekend then by going on a long run with one of my best friends! Kara and I met almost a year ago (at the Boston Memorial 10k) and I look to her as a mentor, a counselor, sometimes co-conspirator, but most of all an awesome friend. So Kara and I decided to run the route for the upcoming Hy Vee half marathon as close as we could, so that we would have a better feel for the course, and to get a nice long run in. It’s so much fun when Kara and Stephanie and I (or any combination of the three) run together. The topics vary greatly, but the love and the bond the three of us share is always felt. Unfortunately, Stephanie is away on business, so Kara and I forged our trail alone. We started at Drake University, worked through downtown, around the capital, around the ballpark, the lake, and then back to the university. It was an amazing run, and the time flew by. Kara at one point asked “Why do we think this is fun again?” I replied, “Don’t worry, in thirty minutes after we finish, you’ll be telling stories about it.” And we did, as we went to dinner and my wife patiently listened as we recalled our funniest moments. It was a great run, and I think we are ready for the half marathon (we got 12 miles in). Saturday morning was the Mayor’s Annual Ride & Run (M.A.R.R.). My wife and I decided to ride in this fun ride so we could learn to ride in a large group of people (there were several hundred riders, but I don’t have the exact count). My wife suggested that we ride to the event, instead of drive, and afterwards ride home. That changed the distance from 25 to 40 miles, and after running 12 miles the previous evening, I didn’t know how my legs would hold up. But I’m always up for a challenge and agreed to do it! I was surprised that not only did I hold up well, I actually felt better after we were finished. I know we didn’t go all out (12.8 average m.p.h) but it’s still a decent ride on tired legs. But I’m glad we did ride, as we learned a lot and we got to see a lot of beautiful areas in Des Moines. We will be looking forward to this event again next year. Happy Easter to everyone! Tomorrow is a rest day (with the exception of yard work), and then Monday I run 5 miles for the Boston Marathon Worldwide Run. 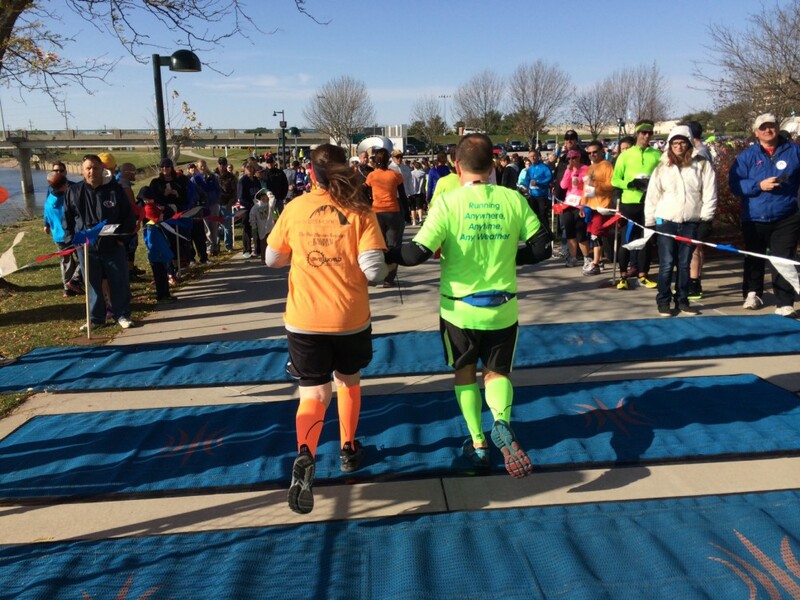 It’s a memorial event where you pledge to run so many miles on Patriots Day. I hope you can join along as well. 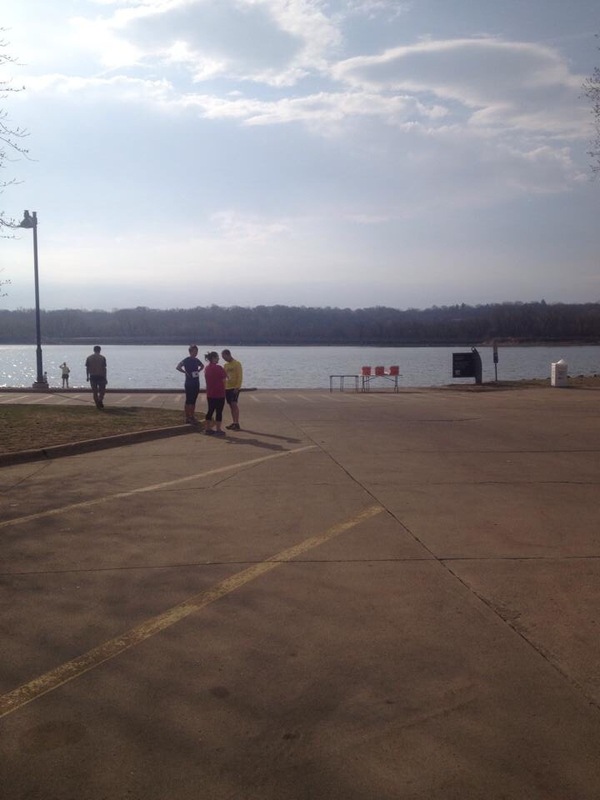 Saturday was a new event for me, an 8k race called Loop the Lake. It is sponsored by the Capital Striders, a great running group in town. 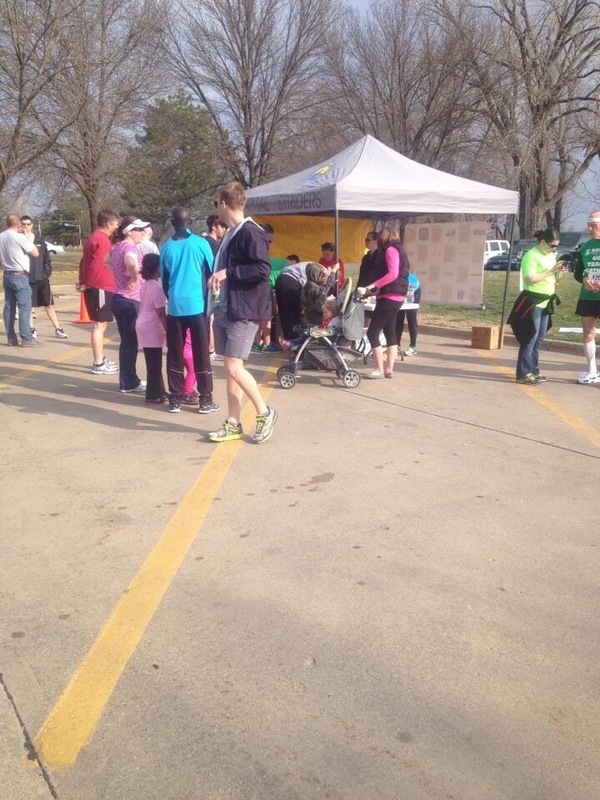 Since I have belonged to the Striders for a year now, I thought it would be nice to participate in a club event. The Friday before the race was the packet pickup, which was at the Confluence Brewery. I sent my wife a text asking if she wanted to go after work, and have a beer after getting the packet. She agreed, and then suggested that we ride our bikes there instead of driving. What a great idea! It was a beautiful afternoon and a great day for a short ride. It totaled 18 miles round trip, and took just over an hour ride time (we did stop to grab some water, but only for a minute). Race day was beautiful! It was a great morning with clear skies and perfect temps to run in. I was still taping the calf that I had trouble with, but after a 10 mile run I figured the tape was merely a precaution now. There were several hundred runners that were running, so I hoped for the best and was determined to run my own race and not the other persons. We started off and I got off to a fast start, 7:57 for the first mile. I was aiming for 9:00 or just under, so I was concerned about holding that pace for the entire race. I settled down (excitement usually gets me running faster to start) and got into a groove. Miles two, three and four came in at 8:23, 8:26 and 8:48. Mile four is a mystery to me: I’m not sure why I slowed down, except I was in a open area where the faster runners were way ahead and other runners were a bit behind. I don’t know if that had any effect, but I was 20 seconds slower than the other miles. I gained the time back on mile 5, as I was able to pick up a good pace runner and then kicked it in another gear when the finish line got within view. Mile 5 was clocked at 8:16, by no means fast but fast enough for me! I recorded 41:56 for the race, something I was extremely happy with. As I drank some chocolate milk and ate a banana, the initial postings came out. The elite and master runners put up amazing numbers, in the 20’s and low 30’s. It must be amazing to literally fly through the course like that! I looked further down the list and got a nice surprise . . . 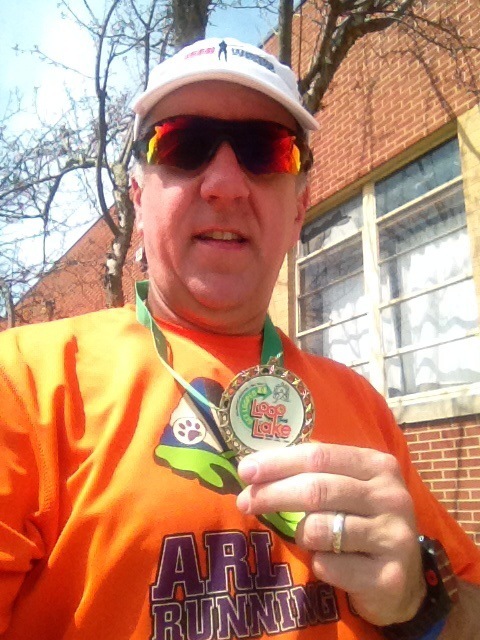 I finished in first in my age division for regular runners (50-54 age group). That was a quite a surprise, and received a medal at the post race ceremony. Now it’s time to prepare for the Mayors Bike Ride and then the Hy Vee half marathon at the Drake Relays. It’s going to be a great year!